Brandeis University houses a number of special collections that focus on anti-Semitism, Jewish resistance to persecution, and radical social movements in the United States and Europe. One such collection is the Helmut Hirsch Collection, donated to Brandeis by Hirsch’s surviving sister, Kaete “Katie” Hirsch Sugarman. Comprised of correspondence, notebooks, diaries, artwork, poetry and other writings, photographic scrapbooks, and memorial publications, the collection documents the life and trials of a young German Jew who opposed the Nazi regime during the 1930s. Helmut “Helle” Hirsch (1916-1937) was a German Jewish youth executed by the Nazis on June 4, 1937. While the facts surrounding the case remain murky—Hirsch was tried and convicted in secret—what is known is that Helmut Hirsch was involved in a plot to bomb the Nazi headquarters at Nuremberg and possibly the office or printing plant of Der Stürmer, a German anti-Semitic newspaper. Born and raised in Stuttgart, Germany, Helmut Hirsch was the elder child of Marta Neuburger Hirsch and Siegfried Hirsch; his sister, Kaete, was one year younger. Hirsch demonstrated a precocious creativity at a young age and he was an excellent artist and draughtsman; included in his collection are sketches, paintings, ink drawings, paper cutouts, block prints, comic strips, illustrated poems, and art books that he produced as a child and adolescent. 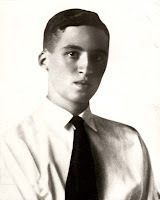 The Nuremberg Laws of 1935 prevented Hirsch from attending university in Germany and he moved to Prague at the age of nineteen to enroll as an architecture student at the Deutsche Technische Hochschule (German Institute of Technology). While in Prague, Hirsch became involved in the Black Front, a group of German expatriates and former Nazi party members who actively opposed Hitler. Hirsch was introduced to the group’s leader, Otto Strasser, by his mentor, Tusk (Eberhard Köbel), whom he knew from his former youth group, Deutsche Jungenschaft. 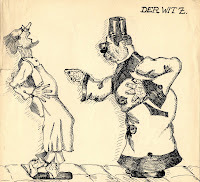 By the time Hirsch’s family joined him in Prague in 1936, he was actively involved in the underground activities of the Black Front, a secret he never shared with them. In December of 1936 Hirsch informed his parents that he would be going skiing with a friend; in fact, he was planning on returning to Germany to carry out the bombing of key Nazi targets. It appears that Hirsch may have wavered in his commitment to the plot, for rather than go directly to Nuremberg as planned, he took a detour to Stuttgart to meet a friend. What Hirsch did not know was that German agents had likely been infiltrating the Black Front for some time and the Gestapo was waiting to arrest him when he re-entered Germany. He was captured in Stuttgart. Hirsch was tried in secret before the so-called Volksgericht (People’s Court) in Berlin in March of 1937; he was sentenced to death for “preparation of high treason and criminal use of explosives endangering the public”—despite the fact he was not carrying any explosives when the Gestapo apprehended him. By the time he was sentenced, Hirsch had been missing for three months and his family had no idea what had happened to him. It was only when his family heard his death sentence announced on the radio (March 20, 1937) that they learned of his fate. They immediately began to make appeals for his release and even sought the help of relatives in the United States. Please care for Vally as for a child. I embrace you, dear mother and you, my father, once more for a long, long time. Only now have I realized how much I love you. The Robert D. Farber University Archives & Special Collections Department is most grateful to Katie Hirsch for donating her brother’s important papers to Brandeis University, and for translating a portion of the materials into English. The remaining translation will take place over time. See the finding aid to the Helmut Hirsch Collection here. For additional information about the Helmut Hirsch Collection, please see the exhibit on our website at http://tinyurl.com/apw8kt. “Secret Document in the Name of the German People” [photocopy], undated. From the Helmut Hirsch Collection, Robert D. Farber University Archives & Special Collections Department, Brandeis University. Helmut Hirsch’s girlfriend, Valerie Petrova. From the Helmut Hirsch Collection, Robert D. Farber University Archives & Special Collections Department, Brandeis University.